This year’s theme, “SPICE Up to Scale Up! (Stimulate. Permeate. Innovate. Connect. Expand! 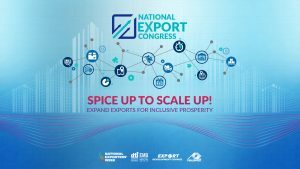 )”, is consistent with the thrust for the Philippine export industry to be at the cutting edge of innovation and connectivity as a competitiveness strategy. It will also be a venue for showcasing government and private sector initiatives to grow exports by encouraging interest in exports and increasing awareness in market trends and opportunities.